WASHINGTON - A man clad in black who was obsessed with President Barack Obama pulled his car within view of the White House at night and fired shots from an assault rifle, cracking a window of the first family's living quarters while the president was away, authorities said about their still-developing investigation. 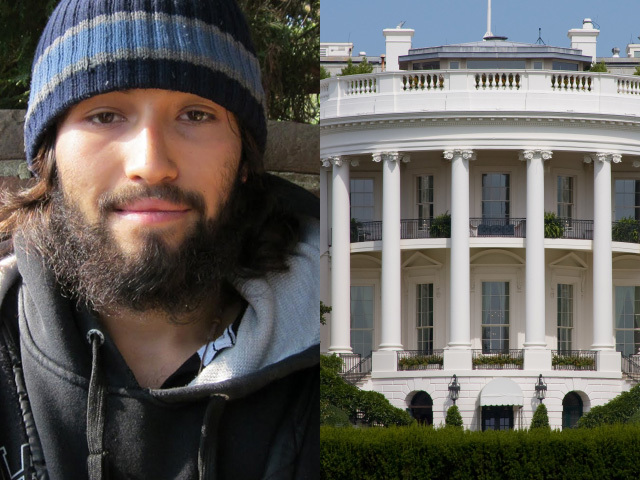 The U.S. Secret Service found two bullets had hit the White House and agents caught up with Oscar Ramiro Ortega-Hernandez in Pennsylvania on Wednesday after a four-day search. Police arrested the 21-year-old Idaho man at a hotel after a desk clerk recognized his picture. Ortega was scheduled to make his first appearance at 2 p.m. Thursday in federal court in Pittsburgh and many questions remained about his motive and background. Sources tell CBS News Ortega-Hernandez was not on the radar of the Secret Service before Friday's shooting. But investigators believe he may have targeted the White House due to a hatred of President Obama. Businessman Monte McCall, said Ortega-Hernandez compared the president to the "Antichrist" when they met recently. "He seemed very sincere in what he believed but seemed rather troubled," McCall said. Police probe possible shots fired near W.H. Authorities are investigating the man's mental health and say there are indications he believed attacking the White House was part of a personal mission from God, according to two different law enforcement officials who spoke with The Associated Press. There are also indications the man had become obsessed with Mr. Obama and the White House, according to the officials, who spoke on the condition of anonymity because the investigation is ongoing. Shots were fired at the building Friday night. Agents discovered Tuesday that one of the two bullets hit the exterior and a second cracked a window on the second floor residential level, just behind the rounded portico visible from the south side of the White House. That bullet was stopped by protective ballistic glass. The window that was hit is in front of the so-called Yellow Oval Room, which is in the middle of the family's living quarters. CBS News correspondent Bob Orr reports ballistics tests are being run to match the bullets found at the White House with the rifle. Prosecutors say they're considering charges of attempted assassination, even though the incident presented no threat to the president. Mr. Obama and his wife Michelle were on a trip to California and Hawaii at the time of the shooting. The president has since traveled on to Australia on a nine-day Asia-Pacific tour. The Obamas were in California without daughters Malia and Sasha, but the White House had no immediate comment on the shooting or who may have been home at the time. Investigators believe Ortega fired the rifle from his vehicle Friday, according to an official with knowledge of the investigation. Gunshots were reported that night on Constitution Avenue about 9:30 p.m. Soon after, U.S. Park Police found an abandoned vehicle, the assault rifle inside it, near a bridge leading out of the nation's capital to Virginia. The car led investigators to Ortega, and they obtained a warrant for his arrest Sunday, officials said. This is not the first time the White House has come under attack. In the last 40 years, the landmark has faced threats ranging from a stolen helicopter that landed on the grounds in 1974 to a man who wielded a sawed-off shotgun on a sidewalk outside in 1984. In 1994 alone, there were five threats including a plane crash on the lawn and a suspected drive-by shooting. Another man fired at least 29 rounds from a semiautomatic weapon, with 11 striking the White House. Dan Bongino is a former Secret Service agent who served on the presidential details for Mr. Obama and President George W. Bush. He said Friday's shooting would likely mean tighter security and coordination. "They do an exhaustive review of their security procedures every time something like this happens," he said. "Nothing ever works perfectly. They will undress this completely and then they will find out when they rebuild the incident exactly what they could have done better." Bongino, who recently left the Secret Service to run for U.S. Senate in Maryland, said it was doubtful that a gunman could strike a target such as the White House from a moving car at the distance investigators suspect he shot. It would require "an incredible amount of training to pull that off," he said, suggesting it was more likely Ortega stopped his car to fire. An official who spoke on the condition of anonymity because the investigation is ongoing said Ortega used a knockoff of an AK-47. Late Wednesday, however, authorities had not conclusively linked his gun to the rounds found at the White House. In the days after the gunfire, police distributed photos of Ortega. He had been stopped and questioned Friday morning just across the Potomac River from Washington in Arlington, Va. Arlington police said they stopped him after a report of suspicious behavior but released him after photographing him because they had no reason to make an arrest at that time. Subsequently, a U.S. Park Police crime bulletin said he was known to have mental health issues. "Ortega should be considered unstable with violent tendencies," the bulletin stated. Ortega was arrested Wednesday afternoon without putting up resistance at a hotel near Indiana, Pa., about 55 miles east of Pittsburgh, the Secret Service said. He was in Pennsylvania State Police custody. State troopers said Ortega had visited the hotel in recent days, and investigators believed he was back in the area Wednesday. The Secret Service passed out photographs and a desk clerk recognized his picture and stalled him while notifying police. Ortega is from Idaho Falls, Idaho, and was reported missing Oct. 31 by his family. A message left for Ortega's mother Wednesday at an Idaho Falls restaurant where she works was not returned. Phone listings for family members in the city were disconnected. Ortega has an arrest record in three states but has not been linked to any radical organizations, U.S. Park Police have said.